By tabling Just Hours legislation today, the D.C. Council is sending a message to thousands of people that they must keep waiting for livable jobs. “The D.C. Council should have kept Hours and Scheduling Stability Act on track to make sure our community has access to stable hours and work schedules. Workers in the District deserve access to full time hours and schedules in advance. Today the Council let down thousands of our neighbors who work in retail and food service and all of their families. By tabling this legislation, they gave into big business lobbyists instead of looking out for hard-working residents in our lowest paying industries. “We thank Councilmembers Mary Cheh, LaRuby May, Brianne Nadeau, and Elissa Silverman for standing with working people and voting to advance the bill forward today. “We’ve heard the narrative that it is too much at once to act on both Paid Family Leave and the Hours and Scheduling Stability Act, when these are in fact the basics of what people need to sustain their families. “Even with more D.C. residents living in poverty than before the recession and with many residents who want to work full-time only finding part-time work, the D.C. Council decided to ignore the needs of hourly retail and restaurant workers at the heart of our local economy. 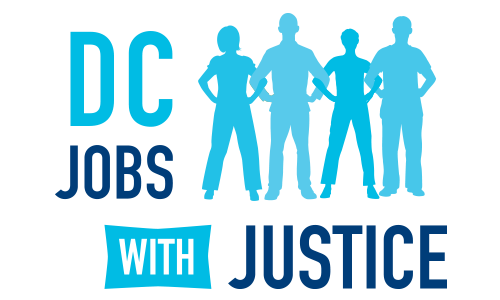 DC Jobs With Justice is a broad-based coalition dedicated to protecting and advancing the rights of working people and supporting community struggles to build a more just society.